Volunteers are a valued part of our NHS family and play an essential role in helping our hospitals do more for patients in our care across the Trust. That’s why we want to recognise the many volunteers who have gone above and beyond to provide an outstanding contribution through our new Make a Difference Volunteering Awards. These awards recognise the positive achievements and behaviours demonstrated by our volunteers in line with the Trust’s four values: Kind, Aspirational, Expert and Collaborative. Every volunteer who wins an award will receive a Make a Difference certificate and a pin badge displaying the award category. If you are a member of staff or a volunteer at the Trust, you can nominate a volunteer to be presented with a Make a Difference Volunteering Award. The Kind award recognises those volunteers who always introduce themselves, have a smile on their face, step in to help, make time for meaningful interactions and show real empathy with our patients and staff. 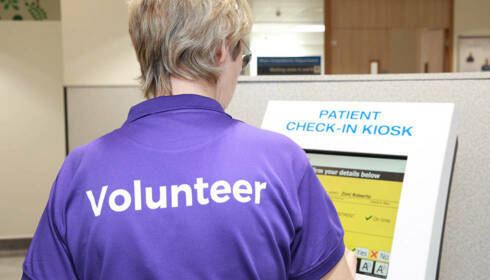 Perhaps you know that one volunteer who always goes above and beyond to show real kindness to your patients? The Aspirational award is all about those volunteers who put themselves forward. They are that role model for new volunteers (and staff), they share thoughtful ideas and feedback about improving our services. They are the volunteers who really champion our volunteers and the work of the Trust, they are out there in their volunteer uniform promoting the NHS and volunteering in the local community. Those volunteers who demonstrate our Expert value are those with a thirst to further their knowledge and skills to be the best volunteer they can be. They are the volunteers who are first to sign up for training, who read the CQC reports and keep themselves up to date with news from around the Trust. They are actively involved in improvement projects within the team. Volunteers who embody our Collaborative value have quickly built relationships with the staff and other volunteers in their team. They take an active interest in their colleagues and are sure to keep them informed about changes in the team, share information from patients and other parts of the hospital. When things change they take the initiative to inform the people who need to know in their team and wider. To nominate a volunteer, click here. For additional guidance on nominating volunteers, click here.